BRASILIA, Brazil Flames raced through a crowded nightclub in southern Brazil early Sunday, killing more than 230 people as panicked partygoers gasped for breath in the smoke-filled air, stampeding toward a single exit partially blocked by those already dead. 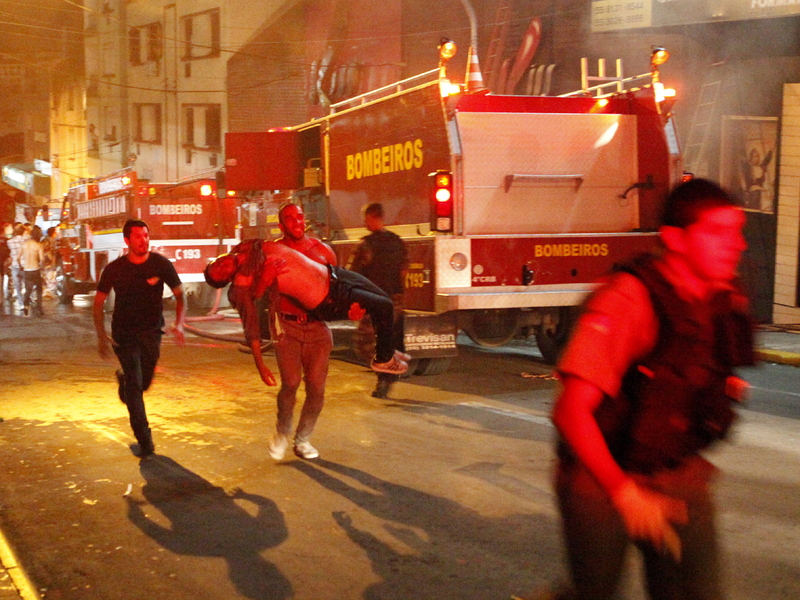 It appeared to be the world's deadliest nightclub fire in more than a decade. Firefighters responding to the blaze at first had trouble getting inside the Kiss nightclub because bodies partially blocked the club's entryway. Witnesses said a flare or firework lit by band members started the blaze in Santa Maria, a university city of about 260,000 people. Officials at a news conference said the cause was still under investigation  though police inspector Sandro Meinerz told the Agencia Estado news agency the band was to blame for a pyrotechnics show and that manslaughter charges could be filed. There was only one way out of the nightclub, and no emergency doors, reports CBS News correspondent Margaret Brennan. Some panicked patrons mistook the bathrooms for an escape and died there. The chaos led to confusion -- security guards briefly blocked the exit fearing that customers were fleeing their bar tabs. Brazilian bars routinely make patrons pay their entire tab at the end of the night before they are allowed to leave. Within hours a community gym was a horror scene, with body after body lined up on the floor, partially covered with black plastic as family members identified kin. Outside the gym police held up personal objects  a black purse, a blue high-heeled shoe  as people seeking information on loved ones looked crowded around, hoping not to recognize anything being shown them. Guitarist Rodrigo Martins told Radio Gaucha that the band, Gurizada Fandangueira, started playing at 2:15 a.m. "and we had played around five songs when I looked up and noticed the roof was burning"
"It might have happened because of the Sputnik, the machine we use to create a luminous effect with sparks. It's harmless, we never had any trouble with it. "When the fire started, a guard passed us a fire extinguisher, the singer tried to use it but it wasn't working"
Police Maj. Cleberson Braida Bastianello said by telephone that the toll had risen to 233 with the death of a hospitalized victim. Officials counted 232 bodies that had been brought for identification to a gymnasium in Santa Maria, a major university city with about 250,000 residents at the southern tip of Brazil, near the borders with Argentina and Uruguay. An earlier count put the number of dead at 245. Most of the dead apparently suffocated, according to Dr. Paulo Afonso Beltrame, a professor at the medical school of the Federal University of Santa Maria who went to the city's Caridade Hospital to help victims.